This statistic shows the response to a survey on internet trolling taken amongst adults in the United States in August 2017. 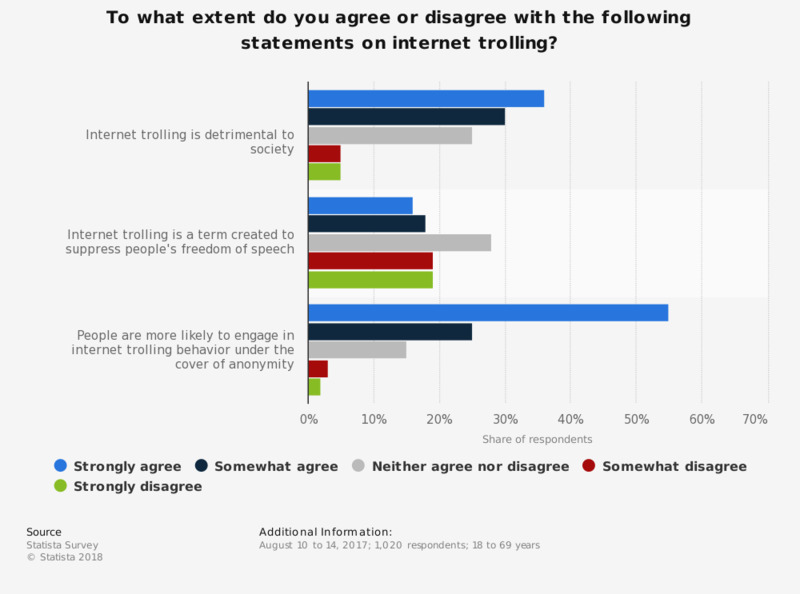 The survey revealed that 36 percent of survey respondents strongly agreed that internet trolling was detrimental to society, whereas only 16 percent strongly agreed that internet trolling was a term created to suppress people's freedom of speech. Original question: To what extent do you agree or disagree with the following statements on internet trolling? Everything On "Cyber bullying" in One Document: Edited and Divided into Handy Chapters. Including Detailed References. Which digital media services do you find important? Which of these statements on digital media do you agree with? Which of these digital media products have you spent money on in the past 12 months?